About 2 million years ago, an exceptionally dry climate phase occurred over most of North America. Grasslands and scrub habitat stretched in a continuous belt from southern California to Florida. Most of the large vertebrates that thrived in such an environment such as llamas, camels, flat-headed peccaries, pronghorns, horses, and donkeys have been rendered extinct or extirpated from the southeast, but the sandhill habitats of north and central Florida still host scores of relict invertebrates in addition to the Florida scrub jay. Specimens found at the Inglis fossil site in Citrus County, Florida provide a glimpse of the fauna formerly inhabiting the once extensive arid grassland and scrub habitat that existed across the southeast during the late Pliocene. 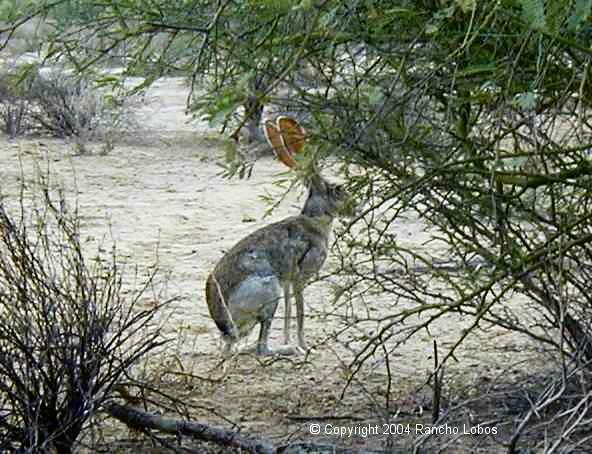 In addition to the above mentioned species, the antelope jack rabbit (Lepus alleni), now confined to the American southwest, was a common component of the ecosystem when the climate was drier. Antelope jack rabbits and an extinct species of jack rabbit lived in southeastern North America during the late Pliocene when the climate was much drier than it is today. Pleistocene glacial cycles also fostered drier climates and an increase in scrubland and grassland habitat, but these environments never again formed an unbroken corridor from west Texas to Florida. I hypothesize that pine and oak forest species evolved a greater drought tolerance and were able to grow in some areas with favorable conditions, thus forming interdicting fingers of habitat that prevented some scrubland species, such as jack rabbits, from recolonizing the southeast. The shaded black areas indicate sand scrub habitat–an environment that once stretched from southern California to Florida. A continous sand scrub belt hasn’t existed for at least 1 million years. Many small species have become isolated in these relict habitats. Most of Florida is so low lying in elevation that numerous high sea stands have inundated much of the state. High sea stands have occurred on many occasions dating as far back as the Miocene and as recently as the Sangamonian Interglacial of the late Pleistocene. High hilltops, however, remained above sea level as islands surrounded by sandy beaches. The sand scrub areas of today are simply remnants of these sandy beaches. The Florida scrub jay (Aphelocoma coerulescens) used to be considered the same species as the Western scrub jay (A. californicus). About 20 years ago scientists declared they were a separate species because they have a shorter broader bill and are less able to disperse following an acorn crop failure. Fossil evidence shows that Florida scrub jays were a distinct species as long as 2 million years ago. The Florida scrub jay is an example of a scrubland species now isolated from populations of its ancestral species–the Western scrub jay. The fossil evidence from Inglis shows that by 2 million years ago, the Florida scrub jay was already a distinct species from the Western scrub jay. 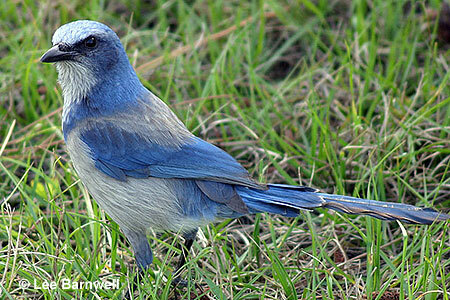 Florida scrub jays are habitat specialists that will not even travel through unsuitable habitat. They are endangered today because much of their habitat has been transformed into subdivisions and citrus orchards. Families of scrub jays living on 1 patch of remnant scrubland will not fly through an orange orchard to reach another patch of scrubland. Studies show that for the bird to survive, they will need corridors of protected scrubland habitat to prevent extinction through inbreeding. Scrub jays are tame birds, known for taking food from people’s hands. Offspring help care for young, a habit that makes them semi-communal birds. 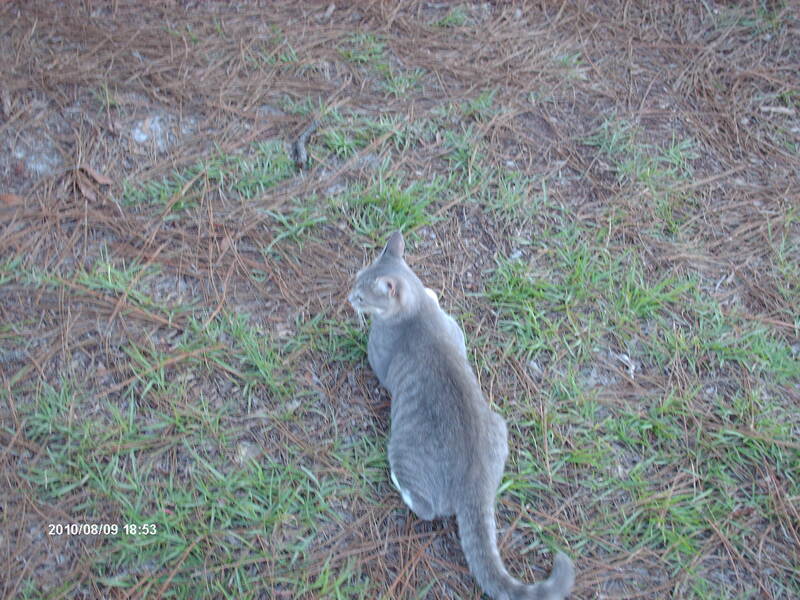 Scrubland habitat in Florida provides a reliable crop of acorns which along with seeds, insects, and small lizards makes up the bulk of their diet. Despite growing stunted, sand live oaks (Quercus germinata). myrtle oaks (Q. myrtlefolia), and scrub oaks (Q. iopina) provide plenty of mast, unlike Rocky Mountain oaks which may fail to produce acorns in the harsher climate there. This accounts for the behavioral difference between Florida scrub jays and Western scrub jays. The former never evolved the habit of dispersing when the acorn crop fails because in Florida’s climate that seldom happens, but the latter did of necessity and is therefore more widespread and not endangered. Over 70 species of invertebrates are also unique to the Florida scrublands. Because it’s such a harsh environment, most plants growing there are high in toxins and have evolved thorny structures to discourage herbivores. But these defenses don’t deter many of the insects that have co-evolved with them. Scrub rosemary is a toxic plant that unwillingly hosts species of a grasshopper, moths, and beetles. Florida sand scrub wolf spider killing an insect. Note the spider is the same color as the sand. 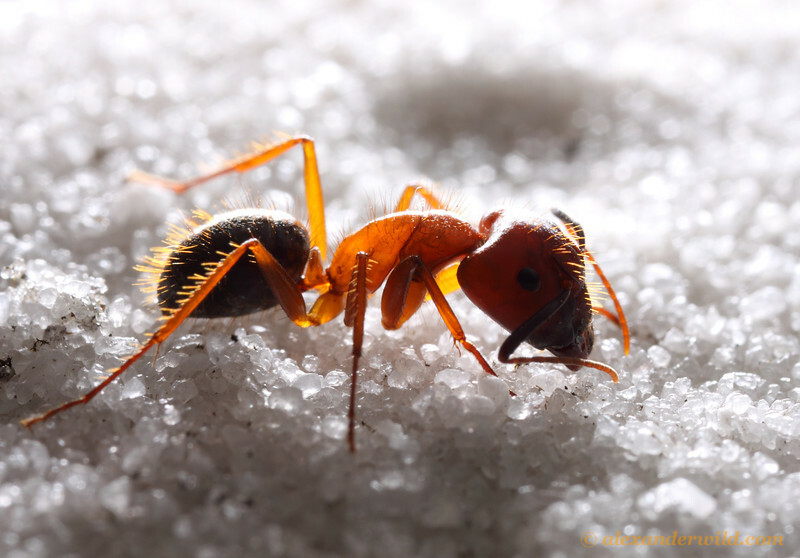 Florida sand hair ant (Componotus floridanus). The hair enables them to travel through sand without sinking. Other unusual invertebrates are specially adapted to living in sand. They have waxy armor that protects them from being shredded by sharp grains of sand, and they have stiff hairs that help them locomote through sand without slipping backward. One species of harvester ant has hair under its mandible in the shape of a basket to carry sand when they excavate their 3 foot deep nests. Hunting wasps are common, and they actively defend their paralyzed prey because in the thinly vegetated habitat, it’s more likely to be discovered by other carnivores such as tiny yellow predatory ants, wireworms, and robber fly larvae which abound under the sand. Each isolated sand scrub community has its own species of short-horned scrub grasshopper…an ideal case study for biologists interested in evolution. The wealth of unique arthropod species found in the Florida scrub attracts entomologists and evolutionary biologists who consder the scrublands a mecca of potential new discoveries. And just think–these invertebrate species once shared a wider range with now extinct megafauna. Thirty years ago, I discovered the joy of drinking beer and smoking pot. My buddies and I played a smoke a joint-drink a beer game that involved alternating those two activities until we were what was referred to as “fucked up.” On a Friday or Saturday night when I wasn’t toiling for minimum wage in the K-Mart Sporting Goods Department, I’d call one of my friends on the telephone and say, “hey, let’s get fucked up!” One afternoon he enthusiastically returned the favor. Unfortunately, it led to an awkward moment–my mom was the one who had answered the phone. If we had known about the habits of the cedar waxwing, perhaps we would have used a different expression for getting intoxicated until we were “fucked up.” Cedar waxwings are fruit-eating birds that on occasion gorge themselves on fermented fruit, causing them to become drunk as the following youtube link shows. I suppose saying, “let’s get as a drunk as a cedar waxwing,” could have become a catchphrase among my old gang, sort of like the codewords we had for drug deals we made over the phone in case the DEA had our lines bugged. We thought it was cool and hip to become intoxicated, but we were only doing something that a dumb bird had likely been engaged in for over a million years before Homo Sapiens even evolved. I’m aware of only one Pleistocene fossil locality yielding remains of cedar waxwings. The La Brea tarpits are famous as the source for hundreds of dire wolf, saber-tooth, and mammoth fossils, but not many people know that just about every extant North American bird along with a number of extinct species left individuals trapped in the tarpits at some time over a period of 40,000 years. Cedar waxwings can be included in this massive bird checklist. Suitable habitats for cedar waxwings during the Pleistocene likely varied in abundance, and the population fluctuated accordingly. Fruit-bearing bushes and trees thrived in the open spaces common during most climate phases. Cedar waxwing eating a fruit that I can’t identify. They often pass fruit back and forth between themselves when they aren’t gorging on them. 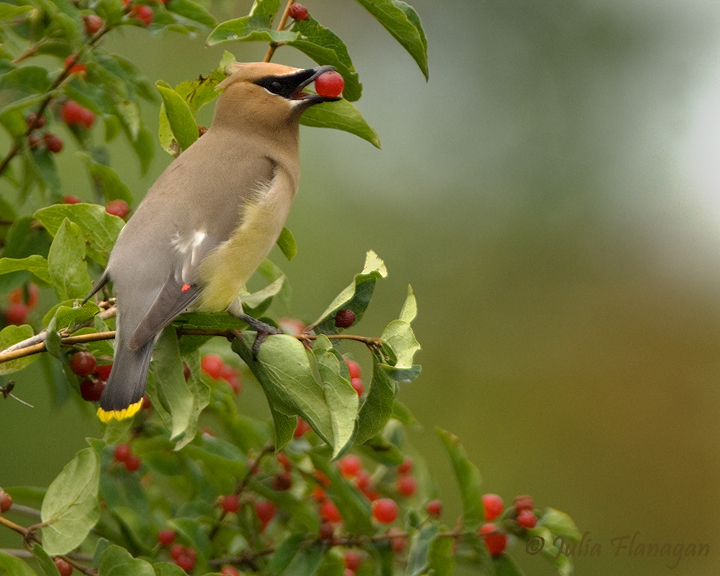 The gluttony of cedar waxwings is an adaptation that helps them maintain their highly migratory habits. They need energy from the fat they accumulate by gorging on sugary fruits such as cherries, blackberries, rasberries, mulberries, pokeberries, mountain ash, buckthorn, hawthorne, privet, cranberry, blueberry, sassafras, dogwood, mistletoe, tupelo, and juniper/cedar. Their preference for the latter fruit explains why they’re known as cedar waxwings. They’re important seed dispersers of these species as well, widely depositing the seeds in their dung. They also eat insects, especially beetles, moths, and flies. They catch them on the wing much like flycatchers. At least half of their modern breeding grounds were under glacial ice during the Last Glacial Maximum. Today, they breed no further south than north Georgia, but they do winter in Mexico and Cuba. Ice Age cedar waxwings may have bred farther south. I’ve only seen cedar waxwings twice in my life. Except for when they’re nesting, these are highly transitory birds that take advantage of locally abundant berry producing plants. If not for this mobility, they would outstrip food supplies and starve. I saw a flock of cedar waxwings when I lived in Ohio in 1970. They came, they ate all the rotted crabapples off our backyard tree in late winter, and they left. Last week, I witnessed cedar waxwings again. They flocked to my front yard, flying back and forth from the tree tops to the bushes and the ground. 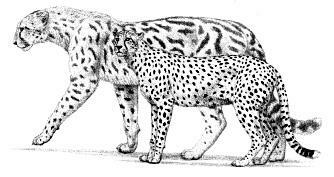 They have a remarkable habit of swerving together to and fro for seemingly no reason, but it’s probably an adapatation to confuse predators. Beech-Magnolia Climax Forests–Another Relic Environment of the Pleistocene? In the piedmont and coastal plain of Georgia and other southern states, bluff forests of northern affinities and bluff and slope forests both occur as relics in areas that are too steep to cultivate and too moist to burn. The species composition of both forest types would probably be more widespread, if not for the influence of man. It is a safe assumption that both forest types were common across Pleistocene landscapes, especially during interglacials, interstadials, and even the weak stadials that preceded the Last Glacial Maximum, though during stadials, prairie and coniferous woods were more predominant. I’m lumping bluff forests of northern affinities together with bluff and slope forests because they are so similar–the only distinction is that the former holds a greater variety of northern species of plants, including disjunct populations of some. The dominant plants in a bluff forest consist of tulip, hickory, black walnut, beech, sweetgum, basswood, oaks (swamp chestnut, red, black, cherrybark), southern sugar maple, cottonwood, umbrella magnolia, red buckeye, mulberry, pawpaw, hornbeam, mayapple, maidenhair fern, Canadian ginger, and bluebell. Bluebells (Canpanula americana) blooming in the forest undergrowth. Disjunct populations of bluebells occur in bluff forests of northern affinities in the deep south. The southern Pleistocene landscapes must have included scenes like this during phases of equible climates. Surprisingly, mountain laurel grows as far south as the piedmont in bluff forests with northern affinities. These lush forests consisting of cool climate species such as beech and warm climate species such as magnolia were probably the most common climax forests during much of the Pleistocene, particularly when climate phases were more equible than they are today with much cooler summers, but only slightly cooler winters. The only important missing floral component of this type of forest that was prevalent during the Pleistocene was the extinct Critchfield’s spruce. Today, both types of bluff forests now only occur on land that slopes toward a river and faces north. These conditions create a cool microclimate. Moreover, feeder creeks and seepage springs protect the mature woods from frequent fire. Before Indians began their annual burning of forests to improve conditions for game, beech-magnolia climax woods probably occupied land that was eventually transformed into open pine savannah. Pollen records show that early in the Holocene about 10,000 calender years BP, hardwoods were more prevalent than pine, even in south Georgia. After the Last Glacial Maximum and into the early Holocene (~15,000 BP-~10,000 BP) beech was much more common in the south than it is today. So for much of the Pleistocene prior to man, primeval forests on moist sites resembled the bluff forests that now can only be found in a few sites along the Savannah, Altamaha, Chattahoochee, and Appalachiacola Rivers. Bluff forests at the latter river hold the southernmost population of American beech which grows alongside southern species such as magnolia, cypress, and palm trees. Other examples of piedmont and coastal plain bluff forests are Magnolia Bluff in Camden County, the Alapaha Bluff, Springhill Plantation, William Bluff Preserve, Altamaha Bluff, and Shell Bluff in Burke County. Beech-Magnolia climax forest at the Tall Timbers Research Station near Tallahassee, Florida. Reportedly, this tract is adjacent to long-leaf pine savannahs. Though the biomass of large mammal species in Beech-Magnolia climax forests of the Pleistocene wasn’t as great as that of Ice Age grasslands in the south, diversity was high. Ice Age grasslands, which probably occurred adjacent to hardwood hammocks, held large herds of mammoths, bison, horses, llamas, and elk. But during interglacials and interstadials when primeval climax forests were more widespread than grasslands, gaps within them supported smaller herds of grazers as well as the beasts of the forest. White-tailed deer, long-nosed peccary, tapirs, Jefferson’s ground sloth, mastodons, and bears all lived in these truly virgin forests where the mast from giant mature trees must have been exceedingly abundant. The forests were the haunt of saber-tooth, jaguar, and dire wolf. The birdlife of today’s world is likely the tiniest of remnants compared to that of the original unspoiled environments because every species living had taken millions of years adapting to it. American birds have only had a few thousand years to evolve to survive in anthropogenic environments, and recent environmental change is occurring at an even more accelerated rate. Common mammal species in South American forests. A similar composition of animals probably occurred in Pleistocene beech-magnolia forests, though the species differed–long-nosed peccary instead of collared, white-tailed deer instead of brocket, Vero tapir instead of the extant South American species. There were no pacas and agoutis but other unusual species such as Jefferson’s ground sloth and mastodons lived there. The closest bluff forest near my house is Shell Bluff, named for the Eocene-age fossil oyster shells found there. Access to Shell Bluff is either a long hike through private property or a boat ride down the river. I didn’t think a trip to see it was feasible for me. However, Dr. Charles Wharton wrote that nearby Griffin’s Landing is an even better example of a bluff forest. I almost explored this area last summer, but it is next to a nuclear plant, and guards from Plant Vogtle close the gate to Griffin’s Landing at dark. I didn’t want to get stuck overnight behind the gate, but now that I know a bluff forest exists there along with fossil oysters, it may be worth a day trip later this year. Relic populations of Atlantic white cedar persist in 5 western and 1 eastern Georgia counties. At one time in the past, the range of the Atlantic white cedar must have been continuous. 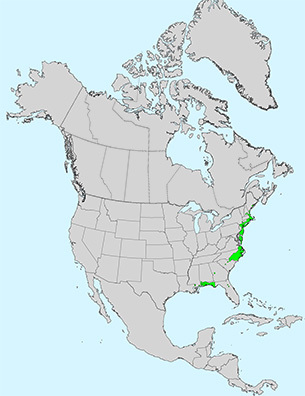 Range map of the Atlantic white cedar. Note the gap between the eastern and western populations. Today in Georgia, disjunct populations of the Atlantic white cedar are restricted to the banks of small streams that flow through the sandhills region in Peach, Marion, Talbot, Taylor, Schley, and Richmond Counties. In the latter county they’ve been reported at Fort Gordon. Unlike the more common and adaptible eastern red cedar, the white cedar needs specific conditions to grow. They require acidic wet soils. This type of environment is common in North Carolina and New Jersey where white cedar is a dominant or co-dominant tree in the Great Dismal Swamp and the Jersey pine barrens. They used to be abundant on Long Island, New York, and many stands still grow near the New England coast. In the south white cedar stands occupy land in the panhandle of Florida, southern Alabama, and coastal Mississippi. But there is a wide geographical gap between the eastern and western populations where the tree is completely absent. This means white cedar must have at one time grown in areas within this gap but habitat here is no longer hospitable for this species. I have a hypothesis that explains this ecological anomaly. Though white cedar prefers moist wetlands, this tree can not survive prolonged flooding. And its seed will sprout in peat after their parents are killed by forest fire. But repeated fire and/or flood regimes will eliminate white cedar from a region, whereas oaks and pines are well adapted to survive in such environments. During stadials, the cool arid climate phases of the Ice Age, forest fires and flooding rivers were rare due to the decrease in lightning and precipitation. However, evapotranspiration rates were low because temperatures were colder. This meant soggy ground on poorly drained soils became bogs, the type of environment favored by white cedar. Bogs no longer exist in much of the southeast, explaining why white cedar occurs as just a relic, but they must have been fairly common during much of the Ice Age. 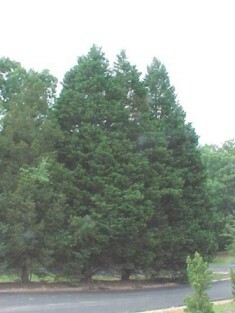 There is fossil evidence of Atlantic white cedar excavated from Cahaba Pond, St. Clair County, Alabama which is in the northeastern part of the state where white cedar is now absent. Cahaba Pond is located in St. Clair County, Alabama. Ice Age plant macrofossils and pollen were excavated here. Atlantic white cedar no longer occurs here but it did during the Ice Age. The fossil white cedar dates to about 14,000 calender years BP and was found associated with beech, hornbean, oak, hickory, elm, ash, striped maple, mountain maple, white pine, and hemlock. Most of these species are fire intolerant, suggesting the environment at this time and at this location did not have frequent fire. Today, white cedar is unable to grow along the rich river bottomlands so common in the south because of flooding, and Indian-set fires long ago extirpated them from uplands where they were probably becoming rare anyway, since bogs began drying up in the warmer climate. In the rare relic environments where they can grow in the south, they’re associated with red maple, tupelo, loblolly pine, fetterbush, pitcher plants, blueberry, gallberry, sedges, and ferns. Great Dismal Swamp in North Carolina where Atlantic white cedar is a dominant tree on poccasins which are bogs with peat and sandy soils. Pollen evidence suggests Atlantic white cedar was absent or rare in North Carolina during the Last Glacial Maximum. And, of course, the tree didn’t grow in New England when it was covered by the Laurentide Glacier. Thanks to southern refugia, where it is mostly absent today, this species was able to recolonize the northern parts of its range as the glacier retreated and left suitable habitat on outwash plains and morraine kettles. Water-loving rodents of many different sizes abounded in Pleistocene marshes and swamps. It’s likely man overhunted giant beavers (Castoroides ohioensis) and capybaras (Hydrochoreus and Neochoreus) into extinction, but several medium and small species remain. Beavers (Castor canadensis) and muskrats (Ondatra zibethicus) are still common throughout the southeast, except in Florida where both are completely absent. However, the presence of round-tailed or Florida muskrats (Neofiber alleni) proves that an aquatic rodent can survive in environments that host significant numbers of alligators. The Pleistocene range of the Florida muskrat is a curious example of Ice Age mammal distributions and how they differed from those of the present. Today, the round-tailed muskrat is restricted to Florida, but during warm climate phases, they use to have a range that extended north. Range map of the Florida muskrat. During warm climatic phases of the Pleistocene, it was more widespread living as far north as Pennsylvania and Kansas where it shared the range with common muskrats (Ondatra). Fossils of Florida muskrats were among those excavated from Ladds stone quarry in northwest Georgia. These likely date to the Sangamonian Interglacial. Their fossils have also been found in Texas, Kansas, and Pennsylvania and in many of these fossil sites their bones were associated with common muskrat (Ondatra) bones. This is evidence that the 2 species of muskrats used to co-exist but presently they do not. Because Florida muskrats are thought to be maladapted to cold climates, they must have only co-occurred with Ondatra zibethicus during extremly warm interglacials when winters were warmer than those of today. 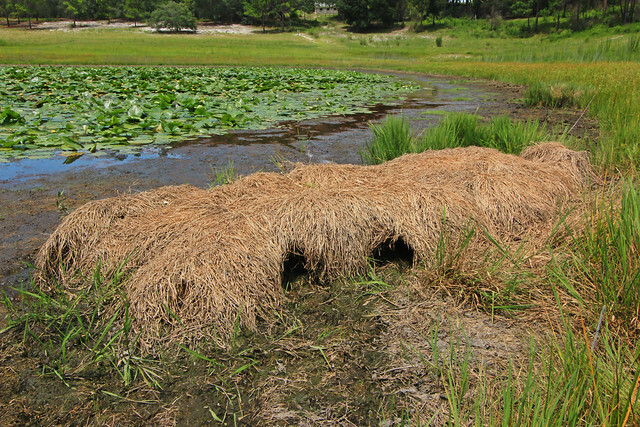 Round-tailed muskrat nest in Putnam County, Florida. Photo by Alan Cressler. Florida muskrats still share habitat with another aquatic rodent–the rice rat (Orzomys palustris). The latter, though restricted to the south, is more widespread. The rice rat feeds upon many of the same foods and utilizes Florida muskrat runways and feeding platforms. They even occasionally build their nests on the roofs of muskrat nests. Muskrat nests generaly consist of 12-25 inch grass mounds that are accessed by 2 tunnels saturated with groundwater. 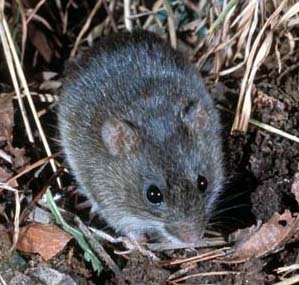 Rice rats construct globular nests 6-18 inches in diameter and are located about 6 inches above the flood line. The preferred habitat of both is a grassy marsh where bamboo cane, sawgrass, cattails, arrowhead, and pickerel weed grow. Rice rats are omnivorous, feeding on succulent plants, mushrooms, seeds including those of iris and rice, insects, fiddler crabs, snails, fish, and carrion. Florida muskrats are more vegetarian, eating mainly the stems of water plants and the roots of ferns, but Frances Harper reported that they ate crayfish as well. 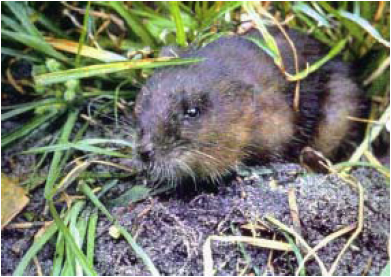 Unlike muskrats, rice rats are not specifically adapted to aquatic life–they do not have waterproof fur and webbed toes and they can live in grassy meadows away from water. But they are good swimmers and divers. Florida muskrats are members of the vole family. Most voles are small mouse-sized rodents, and muskrats are just big overgrown voles. Florida muskrats are gregarious and share feeding platforms with other muskrats. 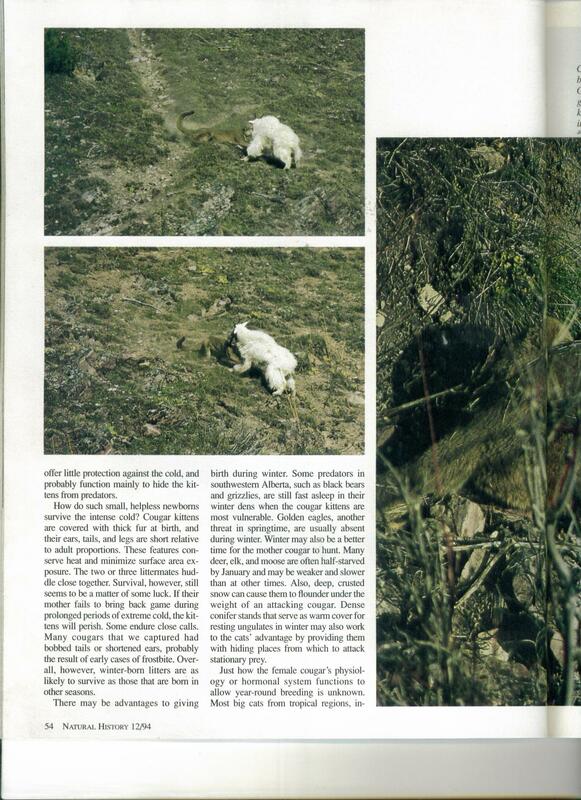 This behavior is not like that of other vole species including Ondatra which are territorial. Rice rats are distantly related to white-footed or field mice. Only 1 species of rice rat lives in North America, but many more occur in South America. The North American species probably is descended from rodents that colonized the continent when a landbridge formed between the two. I’ve never seen a rice rat, but I have seen common muskrats (Ondatra) quite often in and around Augusta, Georgia. I took a boat ride on the Augusta canal a few years ago and saw a score of them. I see their sign in Woodbridge Lake in Evans, and once I witnessed a hawk carrying a muskrat away. I’ve seen a Florida muskrat on 1 occasion. When I was about 10 years old, my grandparents lived on a canal in Inverness, Florida. As I walked along the bank of the canal in the morning, a round-tailed muskrat swam along beside me and barked at me the whole time. Frances Harper surveyed the Okefenokee Swamp circa 1920. He estimated 10,000 Florida muskrats inhabited the swamp but none lived north of it. However, fossil remains of Florida muskrats, dating to the Boling-Alerod interstadial (~14,000 BP) were found at Clarks Quarry, near Brunswick, which is slightly north of their modern day range limit. Curiously, their fossils were found with woodchuck fossils (along with mammoth, long-horned bison, etc.). The climate must have suddenly become much warmer, because woodchucks (which are a cool climate species) were still present in the region, though eventually they would disappear here. It may be that the Boling-Alerod interstadial was a climate phase with warm winters but cool summers, so both species of rodent were able to live in the same geographic range. George Leonard Herter writes in his classic Bull Cook and Authentic Recipes and Practices that muskrat is a delicious animal formerly popular to eat among pioneers of Swedish descent who settled in Minnesota. His method of cooking muskrat was to a) remove the fat, b) boil the hind legs and hams for about an hour, c) season with salt, pepper, and nutmeg, d) sautee in butter and smother in onions and celery. I assume removing the fat and boiling gets rid of the musky odor. 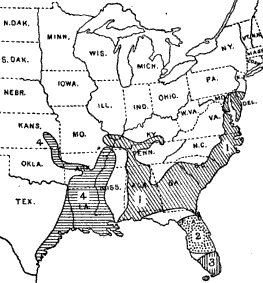 When I first started reading about disjunct populations of the cottonmouth, I thought they might be interesting examples of populations isolated due to climate-influenced habitat change, but I later learned that most of them have become isolated because man has altered the surrounding environment, rendering it unsuitable for the snakes to survive. Horizon-to-horizon cotton and corn fields eliminated habitat for intervening populations over 100 years ago in some areas and even more recently in others. Older adult cottonmouth. The adults turn so black, it’s difficult to see their markings. Young cottonmouth killing a northern watersnake. Note the brown striping which is so colorful compared to the older individual above. Cottonmouths are a semi-aquatic snake that forages in swamps and lowlands, but in regions where frosts occur during winter, they need adjacent forested uplands where they can den in rocks, fallen logs, and rotted tree trunks. A disjunct population of cottonmouths exists at Fosters Bend (a notable locality of which I discuss in more detail below). Fosters Bend is an oxbow lake bordering an intact forest in northwest Georgia. Dr. Charles Wharton believes the population of cottonmouths became isolated here because the surrounding land was cleared for agriculture. Other disjunct populations on the periphery of cottonmouth range were Livingston County, Missouri where they were extirpated in 1987, and Montgomery County, Kansas where they were extirpated in 1993. A genetically isolated population still occurs on Seahorse Key in Florida, but this population is isolated by sea water. The Agkistrodus genus is part of the pit viper family of snakes. DNA analysis suggests copperheads (Agkistrodus contortrix) evolved first, probably before the Pleistocene began. Cottonmouths evolved from copperheads that began foraging in swamps rather than dry upland forests. The speciation was likely a result of a differentiation of habitat preference. The cantil (Agkistrodus bislineatus) then evolved from cottonmouths that expanded their range into Mexico. Pleistocene cottonmouth fossils (just 4 vertebrae) were excavated from the Isle of Hope site in Chatham County, Georgia. Fossil skeletel remains of copperheads were found in Kingston Saltpeter Cave, Bartow County, Georgia. Both species have a long history in Georgia, probably dating back at least 2 million years. Reptile evolution is particularly slow. Cottonmouth range map color-coded to depict subspecies. The blue region is populated by the eastern cottonmouth, A. p. piscivorus. The Florida cottonmouth A.p. conanti inhabits the red region. 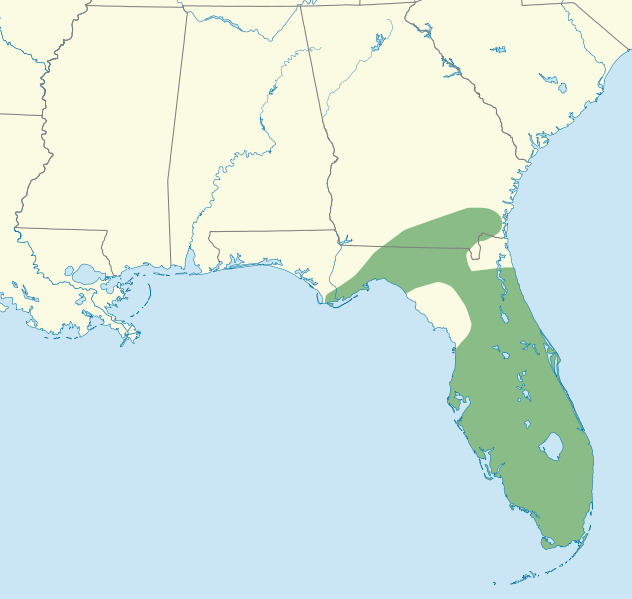 The green region is inhabited by the western cottonmouth, A.p. leucostoma. The gray area has intermediates between all 3 subspecies. A copperhead. 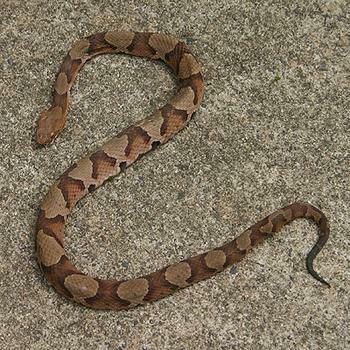 Copperheads inhabit dry upland forests, while cottonmouths live in the lowlands. Cottonmouths probably evolved from copperheads that began foraging in lowland swamps. Pit vipers sense their prey with the pits located near their nostrils. The pits detect changes in temperature–both warm-blooded and cold blooded prey have body temperatures that differ from the surrounding environment. Cottonmouth poison is of the tissue destroying kind. After they strike cottonmouths hang on to small prey such as mice and frogs which might escape before croaking (forgive the pun), but will release larger animals to avoid injury while the animal struggles. Cottonmouths feed on small mammals, birds, birds’ eggs, baby alligators, fish, other snakes including other cottonmouths, snails, insects, and carrion. Algae is often accidentally injested. They are known for congregating around shrinking water holes where they can easily catch concentrated and trapped fish. On Seahorse Key cottonmouths specialize in feeding upon dead fish dropped or vomited by wading birds. Cottonmouths sometimes eat king snakes, and vice-versa–it depends on the size of the snake. Smaller cottonmouths can occasionally repel larger king snakes with body blows, using their head to punch the bigger snake and knock it away repeatedly. They also exude a musky odor when threatened. Other natural enemies include alligators, great blue herons, indigo snakes, and largemouth bass. Cottonmouths return the favor and prey on fledgling herons and trapped bass. There’s a cycle of unwitting revenge in the swamp theater, depending on the age and size of the players. Mites can infest and kill cottonmouths, and almost all are plagued with tapeworms from living on a diet of raw fish. During winter animosity between cottonmouths and other snakes disappear, and they will nest communally. I’ve only seen a wild cottonmouth on one occasion. The snake was a large fat adult, resting on a bank next to Woodbridge Lake in Evans, Georgia. Young cottonmouths have brown stripes but older ones turn so black that the markings become less visible. The individual I saw was completely black. Studies show cottonmouths are not aggressive snakes. About the only way a person can get bitten is if they step on or handle the snake. Doctors treat the tissue-destroying venom with Crofab antivenom. Marlin Perkins, the late zookeeper of Wild Kingdom fame, wrote that the only good thing about getting bitten by a poisonous snake was enjoying a complete recovery, once the antivenom treatment worked. I don’t understand why people keep reptiles as pets. Reptiles form no bonds with people. The part of the brain involved with emotion does not exist in reptiles or any vertebrate less advanced than a bird. Here’s a spot that may be worth exploring, if it hasn’t been developed since Dr. Wharton described it 30 years ago. Photo of Fosters Bend in Floyd County near the border between Alabama and Georgia. 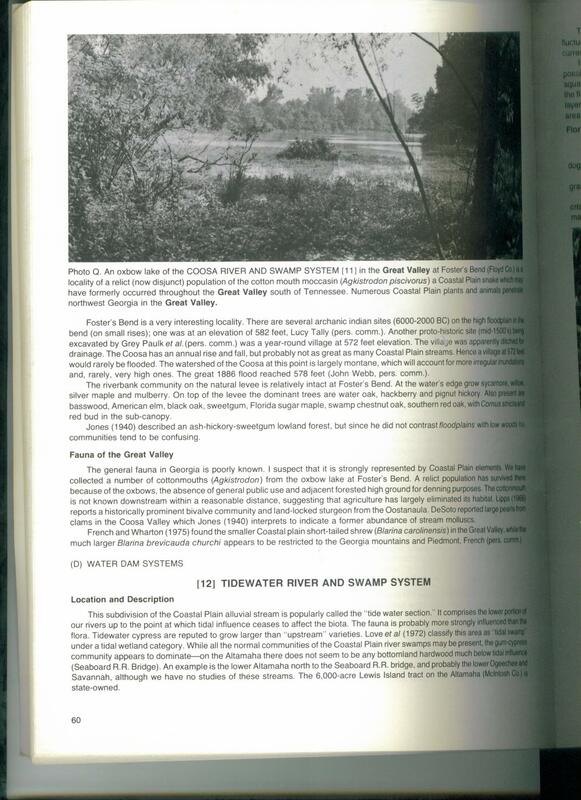 It’s from The Natural Environments of Georgia by Dr. Charles Wharton. Fosters Bend is a Coosa River oxbow lake located in Floyd County in northwestern Georgia. 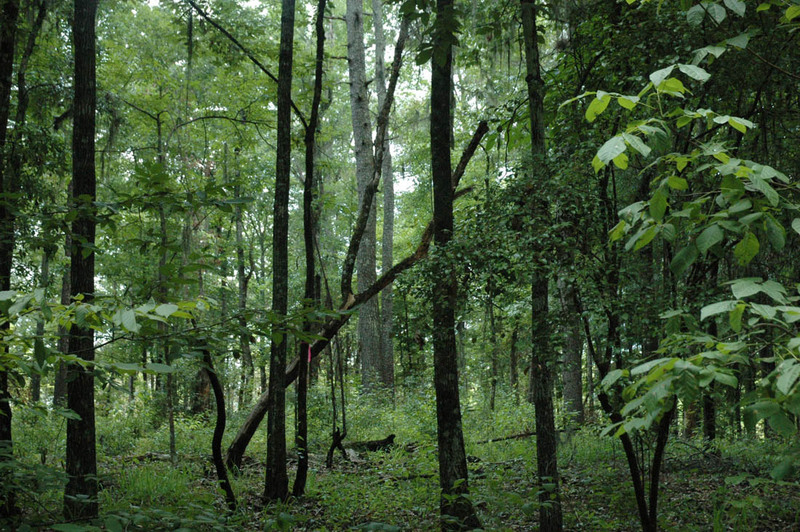 He found a floodplain hardwood forest with species more characteristic of the coastal plain than of the surrounding mountains of north Georgia. One end of the lake has a forest of tupelo. A forest of willow oak, water oak, overcup oak, hickory, and persimmon grows in a dried out oxbow. The natural levee between the oxbow and the Coosa River has a diverse forest of sycamore, silver maple, willow, mulberry, basswood, and several species of oaks. Archaic and woodland Indians sites occur here as well. You are currently browsing the GeorgiaBeforePeople blog archives for March, 2012.